Lenovo has revealed its new Yoga tablet, a consumer-focused device with a unique kickstand and up to 18 hours of battery life. Chinese technology giant Lenovo has revealed its new Yoga tablet, a consumer-focused device with a unique kickstand and up to 18 hours of battery life. The Yoga, which runs Google’s Android operating system, is a sturdy device made of a magnesium alloy. It sports a cylinder to one side that houses a built-in kickstand, allowing it to take multiple positions — the reason the tablet bears the “Yoga” moniker. “What we wanted to do was change the fundamental way users interact with tablets,” said Chet Joshi, retail executive for Lenovo Canada, at a private media event in Toronto Tuesday evening. Stand mode uses the kickstand to prop the tablet upright, allowing for better multimedia consumption. Tilt mode uses the kickstand with the tablet on its back, allowing for a better typing experience. 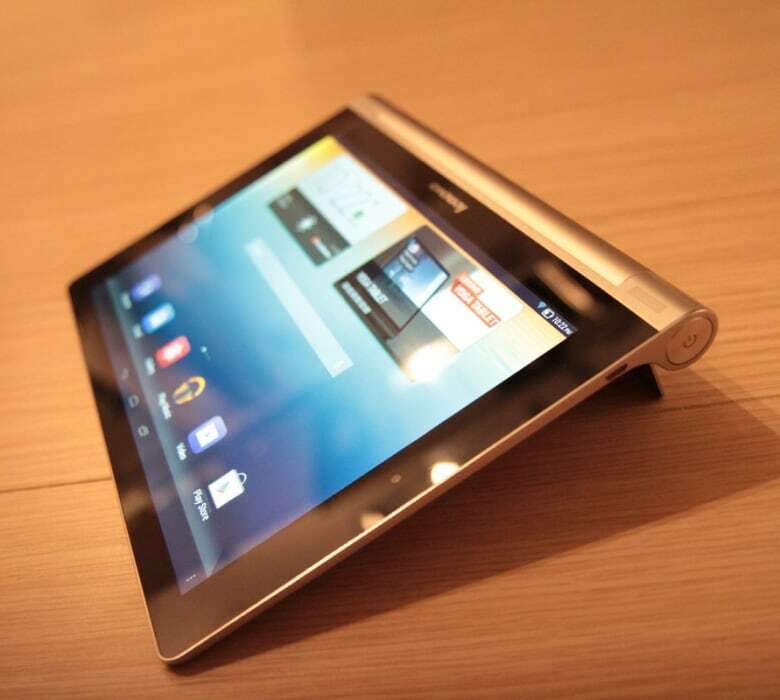 Finally, with the kickstand folded in, hold mode allows the user to grip the tablet by the cylinder. Joshi said the 10-inch model, has a battery based on laptop technology that can last up to 18 hours with light browsing and reading. The screen is a multi-touch IPS display with a resolution of 1280 by 800. The tablet has 16 gigabytes of on-board storage and a microSD slot that could potentially add 64 more gigabytes of storage. The tablet will start at $249 dollars for an 8-inch version and $299 for a 10-inch version. The bigger version is available in stores and online starting today, with the smaller one expected mid- to late November. The Yoga's features are part of a big mobile push for China-based Lenovo, which is hoping to attract new users outside Asia-Pacific markets. The device's global launch event was livestreamed on YouTube, where the company announced a partnership with Two and a Half Men star Ashton Kutcher. More than just a brand ambassador in western markets, he’ll be working with Lenovo engineers on a future model. Lenovo has made tablets before, such as its IdeaTab and ThinkPad Tablet — products that have sold well overseas, but have not made a strong impact in North America. On the public relations front, Lenovo has hired tech-savvy actor Ashton Kutcher to help design and pitch its latest line of tablets. Kutcher, who studied biochemical engineering, will be a “product engineer” with the computer-maker, consulting with its product designers. The Two and a Half Men actor recently starred in a biopic about Steve Jobs and has invested venture capital in more than a dozen Silicon Valley startups. Lenovo's first video advertisements for the new Yoga tablet will feature Kutcher acting as a product tester in his boxers,in a spacesuit and aboard an airplane. In Canada and the U.S., Lenovo is known primarily for its business machines. The company acquired IBM’s personal computing division in 2005, including the popular ThinkPad brand. This year, Lenovo became the top PC maker in the world, surpassing Hewlett-Packard, according to market research firms Gartner and IDC. While that’s a big win for the company, it comes at a time when global PC shipments are down 8.6 per cent from last year, Gartner reported recently. 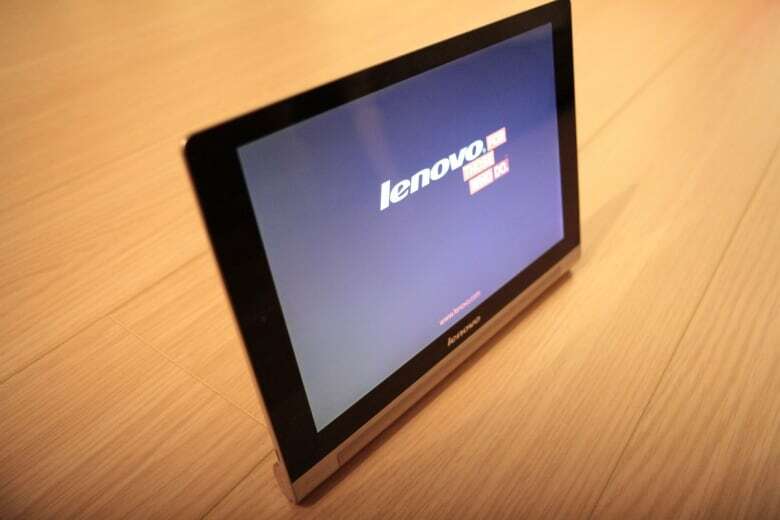 Beyond PCs, Lenovo is diverse, but mainly in the Chinese market. There, it’s a leading seller of tablets and smartphones, which generated more profit than its PC division this year. There have also been rumours the company is mulling over a bid for BlackBerry, after the Canadian smartphone maker put itself up for sale last month. As Lenovo is based in China, any potential deal would be subject to government review. Earlier this month, the Canadian government rejected the sale of MTS Allstream to an Egyptian company because of national security concerns. McIsaac’s sentiment echoes Lenovo CEO Yang Yuanqing, who earlier this year said the company wants to take on established players in the mobile space like Samsung and Apple. For now, Apple remains the king of tablets. The California-based company just announced its new iPad models last week. The latest figures from IDC say Apple has 30 per cent of the worldwide tablet market share. However, that’s down from last year, where the company held 60 per cent of the market. The drop is attributed to the rise in competition from the likes of Samsung, Asus, Lenovo and Acer. In the same period that Apple lost market share, those companies saw explosive growth in the tablet market. Lenovo saw the biggest change, growing 313 per cent, despite being a distant fourth place. For consumers, such heightened competition means more choice heading into the busy holiday shopping season. In the last month alone, there have been new devices from Nokia, Apple, Amazon and Microsoft. Now, with Lenovo’s new Yoga tablets, it’s clear the market is getting crowded.